Virender Sehwag scored the highest individual score of 219 runs which came in just 149 balls with a world record-equalling 25 fours and seven towering sixes. He also crushed a number of records during the milestone event. This came on December 8, 2011 in 4th ODI match against West Indies in Indore. - On 45, he made his highest score as India's captain beating 44 against Sri Lanka at Cuttack on December 21, 2009. - On 82, he established the highest score by an Indian captain against West Indies in India, bettering Mohammad Azharuddin's 81 at Chennai on October 23, 1994. - On 100, he scored his 15th ODI hundred ? his second against West Indies and first as India's captain. - On 100, Sehwag also became the fastest to score an ODI hundred for India against West Indies, taking only 69 balls to do so. He bettered his own record of 75 balls (at Rajkot on November 12, 2002). - On 106, he made the highest score by an Indian captain against West Indies, expunging Rahul Dravid's 105 at Kingston on May 18, 2006. - On 115, he bettered his personal best against West Indies, which was 114 (unbeaten) at Rajkot on November 12, 2002. - On 118, he made the highest score by an Indian batsman against West Indies in India, eclipsing Virat Kohli's 117 at Visakhapatnam on December 2, 2011. - On 119, he made the highest score at this ground, beating Yuvraj Singh's 118 against England on November 17, 2008. - On 128, he set a new record of highest score by any captain against West Indies, bettering upon Australia's Allan Border's unbeaten 127 at Sydney on February 6, 1985. - On 142, he made the highest score by an Indian batsman against West Indies anywhere, improving upon Sachin Tendulkar’s unbeaten 141 at Kuala Lumpur on September 14, 2006. 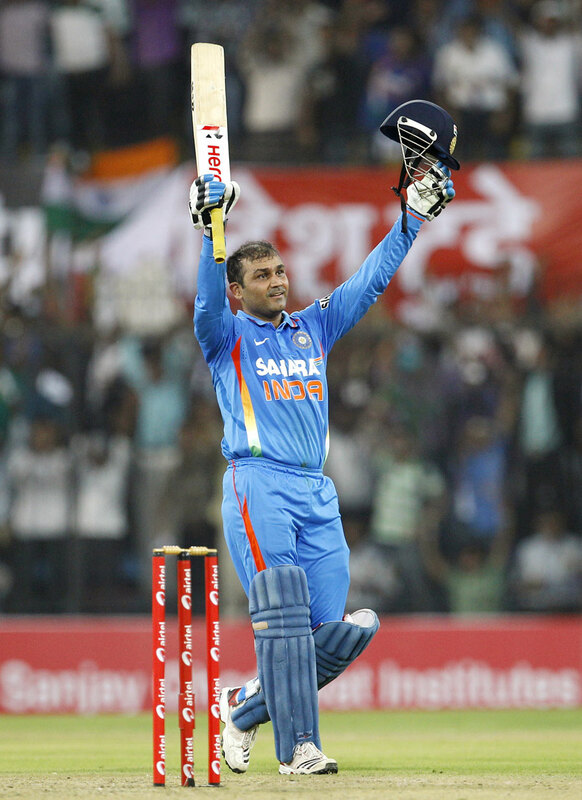 - On 150, he became the fastest Indian to score an ODI 150, taking only 112 balls to reach the milestone. The previous fastest for India was scored by Sachin Tendulkar off 118 balls (vs South Africa in Gwalior on February 24, 2011). - On 147, he made his highest ODI score on Indian soil, beating 146 against Sri Lanka at Rajkot on December 15, 2009. - On 153, he established a new record of highest individual score in India-West Indies ODIs, beating Desmond Haynes' unbeaten 152 at Georgetown on March 21, 1989. - On 174, he established a new record of highest individual score against the West Indies in ODIs, bettering Australia's Mark Waugh's 173 at Melbourne on February 9, 2001. - On 176, he established his highest ODI score, obliterating the 175 against Bangladesh at Mirpur on February 19, 2011. - On 187, he established the highest score by an Indian captain in ODIs, surpassing Sachin Tendulkar's unbeaten 186 against New Zealand at Hyderabad on November 8, 1999. - On 190, he established the highest score by any captain in ODIs, beating Sanath Jayasuriya's 189 against India at Sharjah on October 29, 2000. - On 200, he became the second batsman to score an ODI double hundred after fellow team-mate Tendulkar, who had also made an unbeaten 200 against South Africa at Gwalior on February 24, 2010. - On 200, he also became the first player to score a triple hundred in first-class cricket, a double hundred in List A matches and a hundred in Twenty20 matches. - On 201, he made the highest individual score in ODIs, beating Tendulkar's unbeaten 200 against South Africa. - On 219, he ended up with the third highest score in a List A match after Ali Brown’s 268 (Surrey vs Glamorgan, The Oval, June 19, 2002) and Graeme Pollock's unbeaten 222 (Eastern Province vs Border, East London, October 19, 1974).